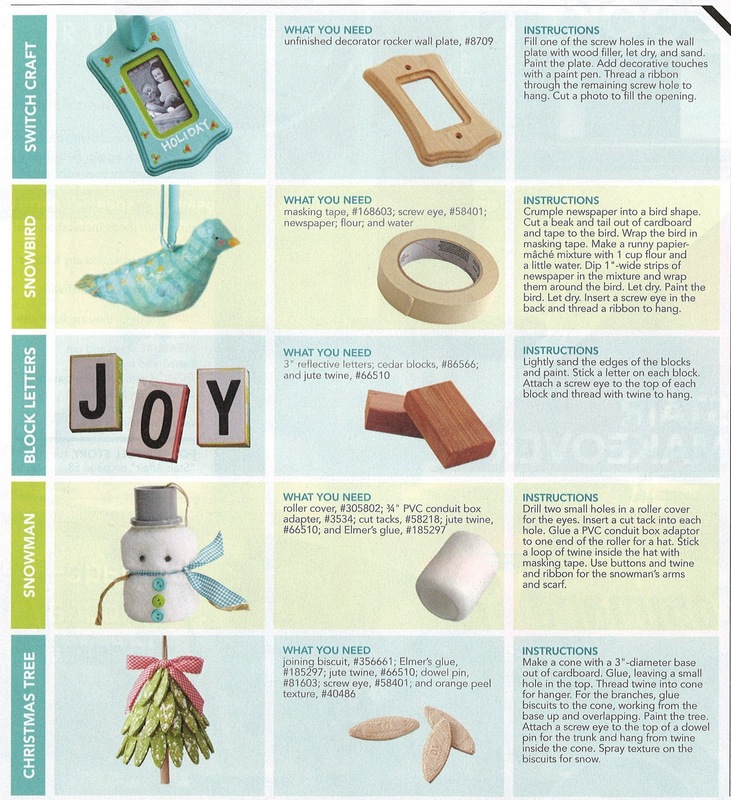 When I received the lastest copy of Lowe’s Creative Ideas magazine, it had a lot of Christmas ideas. Even better it was about thinking outside of the box and using all products that you could buy at Lowe’s to make Christmas ornaments. What an awesome idea!!! I love their statement of “move over macaroni”. Who would think of using finials, biscuits, switchplates, post caps or paint brushes for ornaments? I know I wouldn’t have thought about that on my own. I guess I need to start thinking outside of the box more then. I love the snowman which is made from…..ready for it…..a paint roller. How stickin’ cute is that? And the picture frame next to the snowman is made from a wood switchplate…genius!!! The one I think I love the most is the wood post cap for the chalkboard ornament. Let’s take a closer look at some of these. Sorry I couldn’t find actual pictures from their website, these are scanned in from the magazine. Here you can see all the information you need to make all of these ornaments. 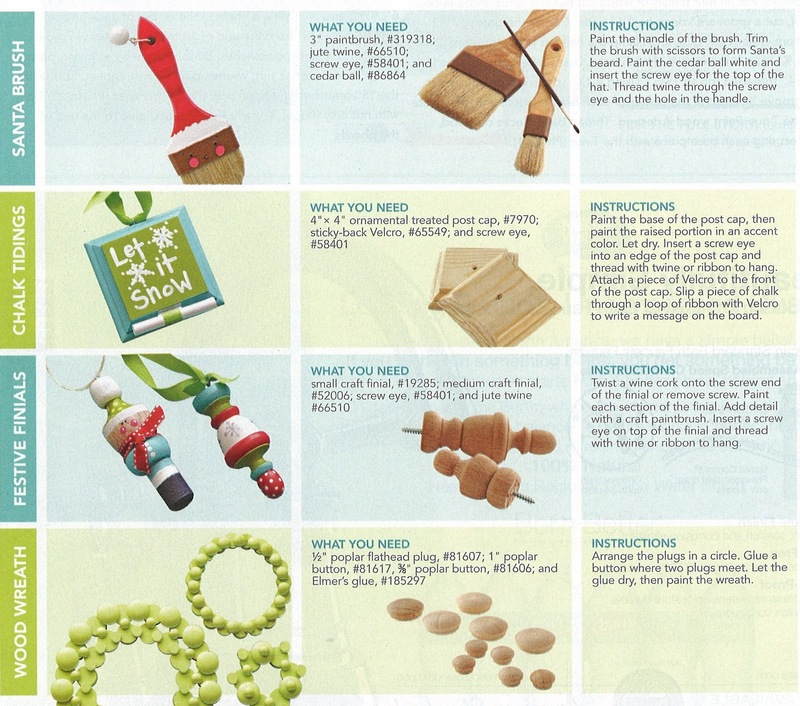 Lowe’s says that these ornaments are under $10 each if you make more then one ornament. Maybe not the cheapest ornament, but it’s great to be able to say that you made it yourself. 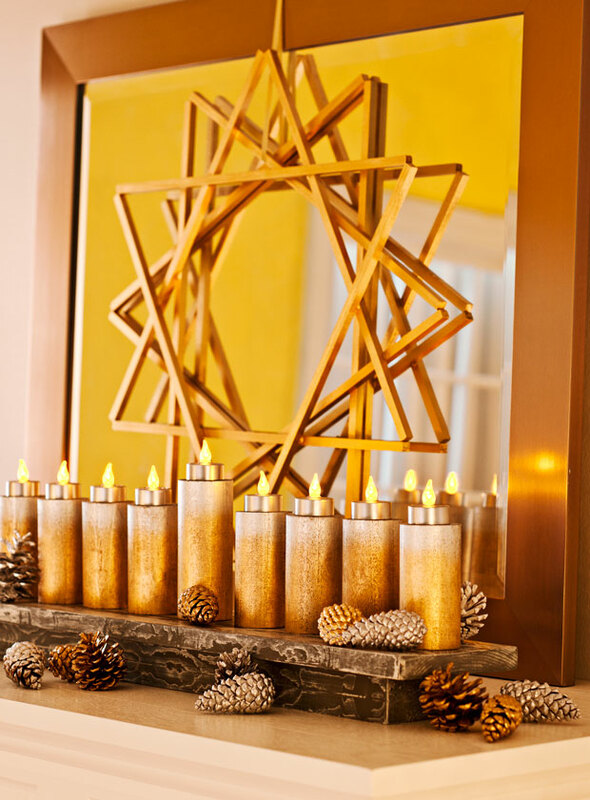 The block letter ornaments could just be wooden letters that you have leaning on the top of your mantel or standing even. I absolutely love these colors for Christmas. Christmas colors do not always have to be dark red and dark greens. I love this palette. 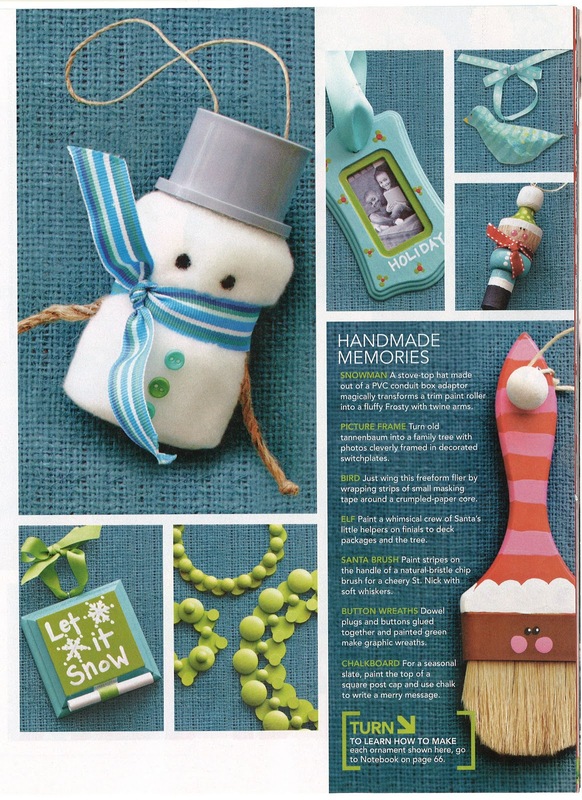 I think I want to make the snowman & chalkboard ornaments. So stinkin cute. I’ll let you know if I get the chance to make any of these before the holidays. I have a lot of other things to do first, but I would really like to do one of these at least. Here is one for my Jewish readers. What a cute idea. Love it. Wood Star directions. They are just made out of wooden dowels. I love how they set this up. Could put it on a mantel or a console table against the wall. Great idea!!! On a separate note, has anyone started using “myLowes” yet? You have to sign up, but it’s free. MyLowe’s is a collection of tools designed to revolutionize, customize and simplify home improvement. Track purchase history with a MyLowe’s card. I think I might check it out. Could help me remember certain things during the year and give me reminders about stuff I need to buy. So which ornaments do you want to make? Have you made one already? 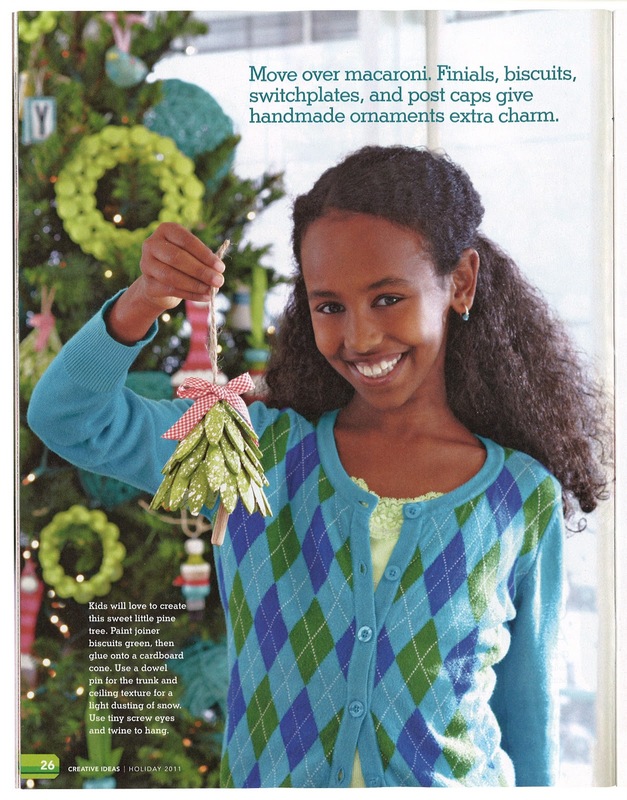 Have you ever made an ornament from the crafty things you have at home already? I would love to hear all about it and I’m sure my readers would love to hear about them too. Let’s dish all the home made ornaments we have made over the years. You can put a link in the comment section if it’s something you have blogged about before. I would love to see pictures. Sorry I’m totally into Christmas right now and I’ve been buying some new things for this year….more to come on that. Can’t wait to share with you. PS: I was not perked in anyway for this post…I just love Lowe’s and the ideas and products they have. I love those! 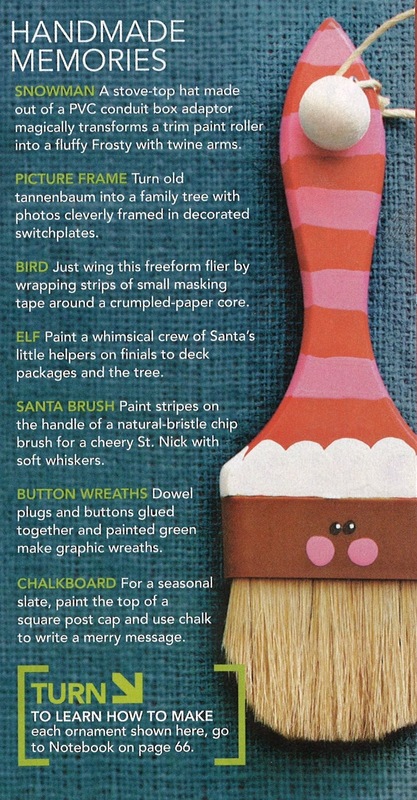 I think my favs are the finial elves and the paint brush Santa! Those are cuties Anne. Thanks for stopping by. Let me know if you make any of these ideas. I would love to see them.